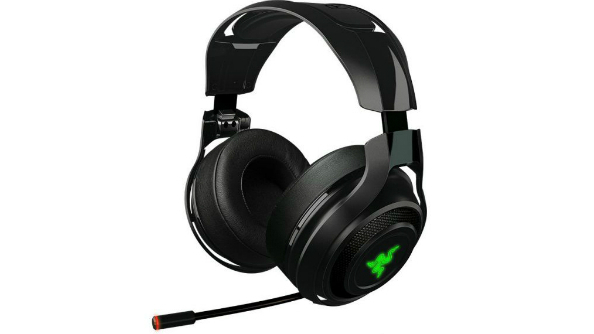 Razer just added a new headset to their lineup, and it looks like a solid offering. The wireless Man O’War aims to minimise the usual pitfalls of going sans cables – interference, cut outs, and that godawful bleeping once your battery starts to get a bit low. Actually it’s fair to say the focus is very much more on those first two elements, but the Man O’War’s specs sheet states a 14-hour battery life, so brain-grazing warning bleeps should be few and far between. Love the sound of bullet casings hitting warehouse floors? The best FPS games on PC will provide a veritable aural feast. Which is to say, it’s better at maintaining a clear and constant signal between headset and reciever than the competition. In their own test area, Razer recorded fewer dropouts and instances of interference with the Man O’War than competitor’s wireless cans. To minimise lag, or as Razer would go as far as saying, eliminate it entirely, an “advanced coding algorithm” is deployed while automatically scanning channels at the 2.4GHz band and chooses the one with least interference. It also features sizeable 50mm drivers and cushioned leatherette earcups, along with a retractable noise-cancelling mic. Oh, and it being a Razer product, you can customise its lighting, if that’s your thing. A lot of people are still put off by going wireless, but products in that category have come a long way in the last five years. It’s certainly worth investigating if you like to walk and talk/are a neat freak with a vendetta on cables. The Man O’War goes on sale April 17 for $200, starting with a limited run.